Below is an aerial picture taken of last year’s conference. 7,000 people attended. They arrive on Friday night and leave on Sunday afternoon. Some are lucky enough to have booked early enough to have secured a room in a guest house or hotel, but most of the others have to put up with camping. They aren’t expected to even feed themselves, Angus arranges and funds all the meals. The only cost is about £6.40 to camp. This fee only cover the loss of earnings to the farmers who aren’t able to farm the fields that will be used for the conference and camping. 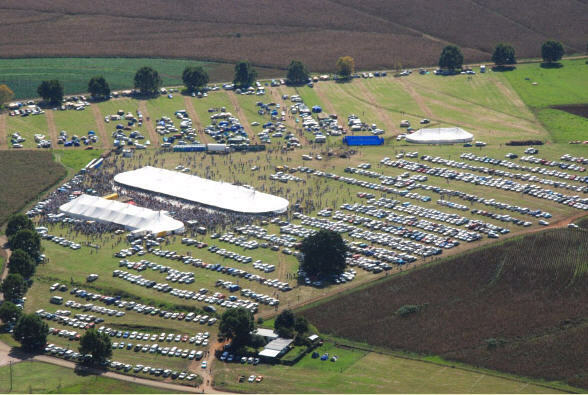 The tent that the conference is going to be held in, is the biggest tent in the world. It takes 3 weeks to erect and 3 weeks to disassemble. It is the size of 3 rugby/football pitches. It holds 30,000 people (already too small). The mind boggles just thinking about it. Tim, always having to equate everything into ‘doughnuts’ did a quick calculation (he works for a bakery!). If they wanted to give each person just one doughnut, they would need a whole truck to transport them. Can you imagine how many trucks they will need just to bring in the food to feed the whole crowd. And how long will it take to feed them. My sister was telling me about the temporary showers they are erecting for the campers. Last year they were make-shift, stand on a pallet while showered with water heated by fires underneath steel drums. This year they’re going high tech. The shower is built in a U-shape and the 2 ends of the ‘U’ is a dressing room. You disrobe and leave your towel in the dressing room, walk into the u-shaped passage way, which works like a car wash. You’re sprayed with water, but keep moving, then you’re sprayed with soap, but keep moving, you wash as you go along, and finally you’re rinsed with clean water before you’re back in the dressing room. You pick up your towel, change back into your clothes, and “pronto!”, you’re ready to go. I am absolutely fascinated by the planning and logistics. My whole family has been involved and I have tried to make them promise to take some pictures for me. Whether they will have time, is another matter, but if they can, I shall be sure to post them on here.